The Hubble Space Telescope captured this image of the globular cluster NGC 1898, which nears near the center of the Large Magellanic Cloud galaxy. Wow. That's a lot of stars. 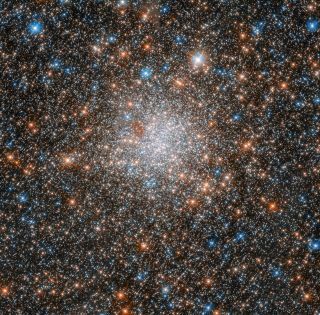 The uncountable multitudes of the globular cluster NGC 1898 shine in a newly released photo by the famous Hubble Space Telescope, a joint mission of NASA and the European Space Agency (ESA). "Today, we know that globular clusters are some of the oldest known objects in the universe and that they are relics of the first epochs of galaxy formation," ESA officials wrote today (Oct. 22) in a description of the image. "While we already have a pretty good picture on the globular clusters of the Milky Way — still with many unanswered questions — our studies on globular clusters in nearby dwarf galaxies just started," they added. "The observations of NGC 1898 will help to determine whether their properties are similar to the ones found in the Milky Way, or if they have different features, due to being in a different cosmic environment." The Hubble Space Telescope launched to Earth orbit aboard the space shuttle Discovery in April 1990. Its initial images were blurry, an issue that mission officials traced to a slight defect in the telescope's primary mirror. Spacewalking astronauts fixed that problem in December 1993, and further maintained and upgraded Hubble on four additional servicing missions from 1997 to 2009. On the final servicing mission, in May 2009, astronauts replaced all six of Hubble's orientation-maintaining gyroscopes. The third of those six gyros recently failed, sending the telescope into a protective "safe mode." Hubble needs three functioning gyros to operate at maximum efficiency, and a backup that mission team members aim to recruit hasn't been behaving as planned. But NASA officials have expressed confidence that the iconic telescope will be back up and running again soon, even if the backup doesn't fall into line; Hubble can operate in one-gyro mode, with a second gyro acting as a backup.